Memorial program template cards are samples, which you can utilize and personalize as per your specifications. In the article below, I have suggested a few ways to customize a sample memorial card. Memorial program template or sample Memorial cards are illustration that you can use as per your individual preferences. People generally find a suitable template, and fill it (get it filled) with their details. Memorial program cards are distributed for calling in the people at the Memorial event of a person. These cards are posted by the members of family of the person, who has died. The memorial card carries the news of the sudden bereavement of someone, close to heart. It needs to be composed and edited keeping the simplicity and elegance in mind. In the following snippets, I have tried to explain how you can personalize Memorial card, in a step by step process. Find A Suitable Memorial Card Sample – There are many places, where you can find Memorial card samples. The most common whereabouts for buying Memorial program template is local stores; the traditional way, following which, you usually purchase your sample invitation cards for other family events and occasions. But, this occasion is far different from other happy occasions. No doubt, your local card shop is well-equipped with modern day machine and applications, but ask a question to your inner self – Do you really have time to visit the card shop after someone, from your family, has become the victim of nature’s law, and left the physical world? No, you don’t have that much time. You have to make the arrangements for the Memorial event. But, Memorial cards too are very important, aren’t they? 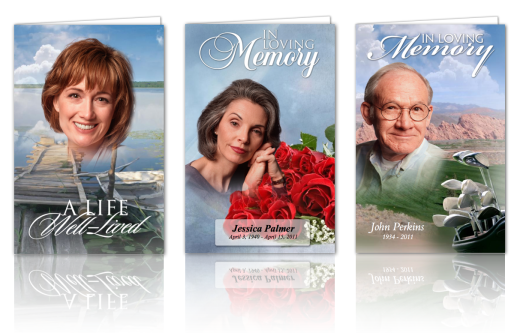 You just need to pick a Memorial card template, and download it on your computer, and follow the next steps.You can purchase your desired Memorial card from a website that sells Memorial program templates. It will save a good amount of your time. Additionally, you can have a look at a wide range of Memorial sample cards that have never been used. They always have fresh designs that look simple and elegant. Fill In Your Specifications – Here comes the second step. You have gotten the Memorial event’s sample card, now you have to fill the details in it, and personalize it. Change the cover – Cover image is the first thing, which the recipient will check out at the very first glance. You can use any of image of the deceased as the cover picture of the template. Change the title – Second most important part of personalizing a Memorial program template. You need to pick an attractive yet elegant title for the card. Edit the venue – Everything provided in the template is given as example; you need to change the venue details, as address, timing, etc. List of customs – You should never forget to edit and highlight the list of services or programs that are going to take place at the Memorial. For this, speaking to the church representatives would be a great help. Poems – You can add any of the favorite poem of the deceased. Otherwise, you can also compose a poem for him/her, and put it in the card. This would be best personalization of the sample card. Bible Extractions ­– Every Memorial card has some referencing from bible. You too can add something like this the card.